Suddenly we’re not just looking at one moment in time, we’re seeing a story. 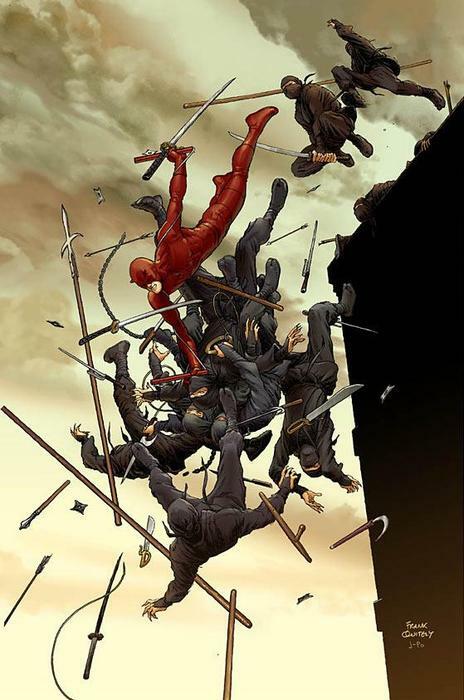 Daredevil versus a sneak of ninjas, swords flying. We have three different things going on. At the top, two ninjas are prepared, ready, posed, jumping into the fray. In the middle, Daredevil is ably dispatching a few of their friends. 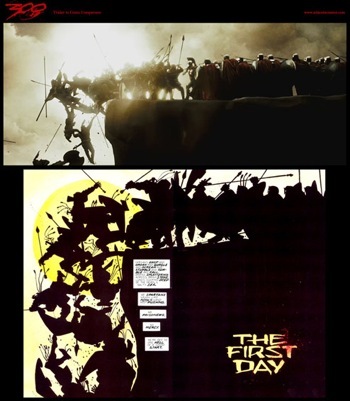 And in the bottom, the ones Daredevil has already defeated, their weapons in freefall below them. All in one image. This is visual storytelling. The thing that really hit me, wasn’t so much what Superman was saying as how he was sitting. He was perched on a bollard with one knee drawn up, chin resting on his arms. He looked totally relaxed… and I suddenly realized this was how Superman would sit. He wouldn’t puff out his chest or posture heroically, he would be totally chilled. If nothing can hurt you, you can afford to be cool. A man like Superman would never have to tense against the cold; never have to flinch in the face of a blow. He would be completely laid back, un-tense. 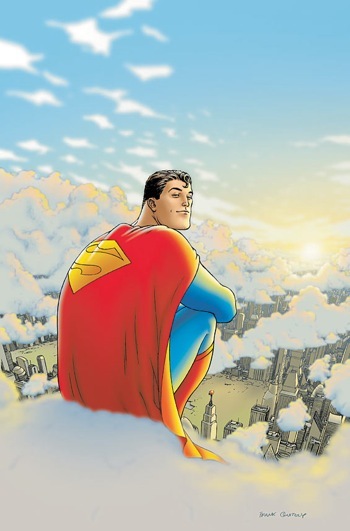 With this image of Superman relaxing on a cloud looking out for us all in my head, I rushed back to my hotel room and filled dozens of pages of my notebook with notes and drawings. Look again at how Quitely draws this scene. See how relaxed Superman is as he watches over Metropolis. Now look at how much depth is in that picture. It’s easy to focus just on Superman, but there’s a fully-imagined city below those clouds. You can see The Daily Planet just peaking up by Superman’s boots, with Centennial Park just beyond. The plane of clouds Superman is sitting on is hundreds of feet up, where it’s calm. 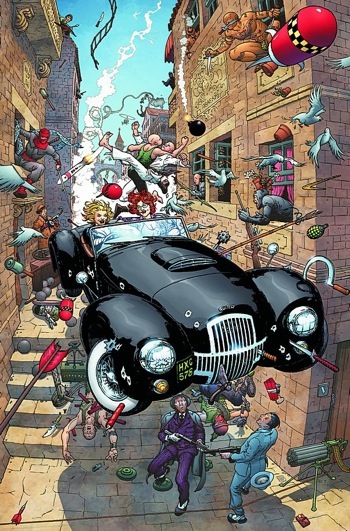 Quitely captures the scope of the entire world there, floating hundreds in the sky. The city under those clouds isn’t just background filler, it’s the real focus of the image. More of his stuff at Comic Art Community.